Radical departures from the set and familiar rules of technique often become necessary in the course of psychotherapy and psychoanalysis. These can include conducting a session outside the office, giving advice, not charging fees, talking about oneself, giving a gift to the patient, and so on. Such interventions have so far remained imbued with mystery or, worse, have been the staple of cocktail party conversations. 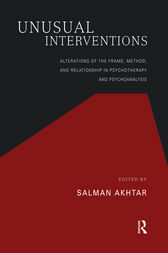 Unusual Interventions brings a variety of exceptional measures together to highlight their indications, risks, and their potential anchors in psychoanalytic theory of human relatedness. In accomplishing this, the book itself becomes an unusual addition to the literature on the technique of psychotherapy and psychoanalysis.